“Those who danced were thought to be quite insane by those who could not hear the music." On Wednesday 26th September we were asked to sing at La Barbe in Reigate Surrey. La Barbe is a fabulous French restaurant who were celebrating their 30th Birthday. We had a fantastic time providing the entertainment for this special event and thoroughly enjoyed watching couples dancing together at the end of the evening...very romantic! On Sunday 23rd September we had the pleasure of singing at The Landmark Wedding Fair in London. It was a fabulous day and we met so many lovely people. The venue was absolutely stunning and it provided such a great backdrop for us to showcase some of our favourite songs whilst looking at all the beautiful wedding dresses on the catwalk! We talked to many Brides and Grooms about singing during their wedding ceremonies and drinks receptions and we look forward to singing for them on their Big Days! On Friday 14th September Katie and Richie got married! They asked us to be their wedding singers and we were delighted to be a part of their special day. It was a beautiful sunny day and after they got married in Guildford the gorgeous Bride and Groom arrived in their fabulous newly restored Jaguar to The Woolpack in Elstead, Surrey where all their friends and family were gathered. As the champagne corks were popped and the photographs were taken we sang some lively music to get the celebrations off to a swing! We noted many a toe tapper!! After a couple of hours the newlyweds and their guests sat down for their sumptuous 4 course Italian wedding breakfast which we accompanied with some mellow jazz tunes to set the tone and create a classy atmosphere. We had a truly wonderful day singing for Katie and Richie and were thrilled to help play a part in making their day magical. We wish them a lifetime of happiness. Congratulations! “Thank you Nightingales, you were amazing. You added a sparkle to our special day.” Katie & Richie. On Wednesday 1st August 2012 we were asked to sing at the beautiful Clandon Park in Surrey. It is a truly wonderful wedding venue (Katie got married there in March!). They asked us if we could sing for a food tasting event they were holding for all their upcoming brides and grooms. We sang for a couple of hours showcasing our popular wedding breakfast music whilst they ate all the gorgeous food!! 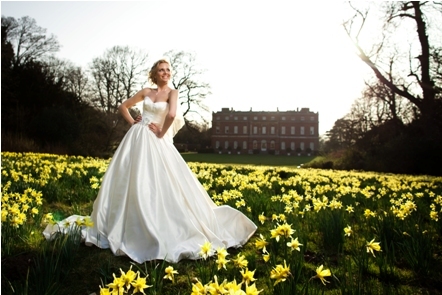 We had a wonderful evening and are now listed as suggested wedding singers for Clandon Park. We look forward to returning there very soon. We were up bright and early last Monday for our photo shoot at the Bel and the Dragon, Godalming, Surrey. Obviously we had to start the day with a strong coffee (a cuppa for Em!) without which we both can’t function!! Our lovely photographer Jamie (www.jamkatstudios.co.uk) got stuck in straight away and came up with some great shots! Have a look in our Gallery to see the results!